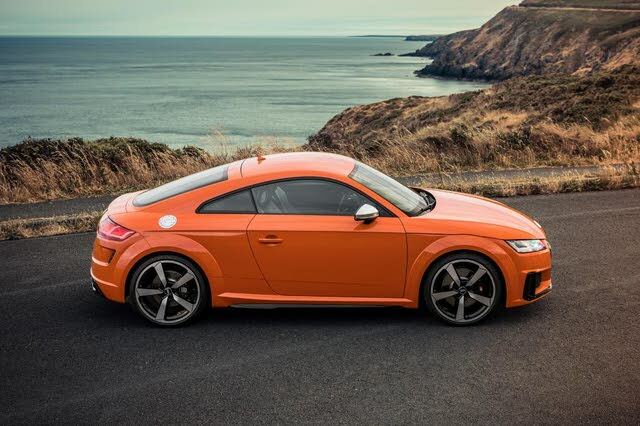 Looking for a New Audi TTS in your area? CarGurus has 308 nationwide Audi TTS dealers with 304 new car listings. Audi’s first TT arrived in 1998, when its bubbly, Bauhaus-inspired styling was timed just right for the dawn of the new millennium. That gave way to a second generation of the TT in 2008 and a third redesigned from the ground up for 2016. All that time, the regular TT has been more about high style than outright performance, and any thoughts of practicality fly right out of its slanted-back, gun-slit windows. Available only as a coupe, the mid-range TTS variant bestows the fashionable model with some true performance credibility. For 2018, the TTS receives very few changes. Specifically, the TTS has a more-powerful version of the regular TT’s 2.0-liter turbocharged inline 4-cylinder engine and 6-speed dual-clutch “S-tronic” automatic combo. The TTS’s uprated engine churns out 292 hp and 280 lb-ft of torque, which is an increase of 72 hp and 22 lb-ft over the TT. The coups jumps to 60 miles per hour in just 4.6 seconds. The TTS’s transmission also features gears that are spaced closer in order to match this engine’s more-rev-happy nature. Power is delivered to all four wheels by the permanent all-wheel-drive “quattro” system, which is front-biased but can vary the torque between the front and rear axles as demand changes. The TTS is a predictable and efficient sports coupe that handles everything asked of it, but garnered faint praise in this segment. Critics complained about the TTS’s dulled-down, filtered road feedback, especially compared to its nearest rival, the Porsche 718 Cayman. The firmer suspension and large wheel options, coupled with the vehicle’s naturally-short wheelbase, create a ride that is rough in any of the Audi’s four driving modes, which severely hampers its ability to be a daily-driver. Some drivers care less about the ride and more about making a statement, and this is where the TTS shines. This latest TT series seeks to further refine the shapes of its predecessors with Audi’s current design traits of irregular hexagons, straight edges, and sharp panel creases with the bubbly Bauhaus-inspired charisma of the very first TT. The characteristics that have come to identify a TT are preserved here: the athletically-arched roofline, wide stance, tall beltline, and abbreviated deck. The TTS’ $9,000 premium upgrade over the ordinary TT shows only subtle changes from the outside. The main telltales for a TTS are a revised front-fascia with a fancier grille and downturned lower intakes, satin-chrome mirror covers, and dual exhaust tips on each side, framing a small rear diffuser. However, these worthy changes are enough to transform the Audi’s appearance into something more athletic and menacing than the TT. The TTS does not open the model up to a wider variety of colors, but the standard palette does include eye-catching red, yellow, and blue hues. The interior is a marriage of form and function that plays right into Audi’s technological strengths. It starts with two racing-inspired leather-and-anthracite seats with diamond stitching—not available on the normal TT—flanked by brushed aluminum trim sections. The driver area is dominated by a 12.3-inch “virtual cockpit” LCD instrument cluster that serves up driving, navigation, and audio information as the main display interface for the whole car. The vents are elegant turbine-shaped units whose center bezels incorporate the switchgear and displays for the entire HVAC system. A tidy row of driving-related buttons completes the center stack, and the infotainment controls and electronic parking brake switch are laid-out neatly behind the console-mounted gear selector. It all adds up to an interior that’s high-tech but comfortable and blessedly-minimal on buttons. The virtual cockpit earns high praise for being intuitive, snappy, glitch-free, and easy to operate while driving. However, without the Nappa Red leather option, the cabin may be a bit too stark for the segment. One suggestion to Audi would be to offer the TTS with the same Palomino Brown upholstery that’s available on the lesser TT. For such a German car, Audi has limited the options to a few narrow add-ons and swaps. As it stands, the TTS comes in just one trim. Buyers can upgrade the 19” 5-spoke wheels to 20” 10-spoke forged or 20” 5-spoke titanium units. 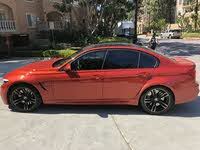 Also available is full leather seating, red brake calipers, and a Black optic package that swaps out most of the car’s bright-work with high-gloss black trim. On the tech front, Audi offers a single Technology Package, which includes navigation, telematics, blind-spot monitoring, Apple CarPlay and Android Auto interfaces, and a 12-speaker, 680-watt Bang & Olufsen sound system. The TTS is handsome, competent on the track and street, and reasonably livable. Its price lives right in between those of the base TT and the top-trim TTRS. For that palatable cost increase, a buyer does get quite a few meaningful upgrades. But since the TTS doesn’t exist in a vacuum, it must be noted that it faces some serious competition from Ford’s Mustang variants, which rival the TTS in power and price. And while drivers could get the same performance for less cost out of the Golf R or Audi’s own S3, many customers will still find themselves drawn to the TTS’ playfully aggressive design that so perfectly embodies new-millennium optimism. What's your take on the 2018 Audi TTS? Have you driven a 2018 Audi TTS? Enter your zip to see incentives for a new TTS in your area. CarGurus has 182 nationwide TTS listings starting at $13,997.